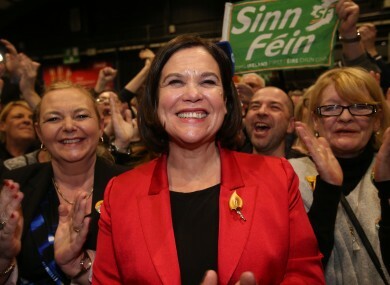 MARY LOU MCDONALD heavily criticised Fianna Fáil in her speech at this year’s Sinn Fein Ard Fheis in Dublin today. The deputy party leader said she was “only scarlet from the compliment Fianna Fáil pay us by borrowing our policies”. If imitation is the sincerest form of flattery then we Sinn Feiners are only scarlet from the compliment they have paid to us by borrowing our policies. McDonald said Fianna Fáil was “never serious in its manifesto promise to scrap the water charges and it was scrap the word they used”. She said 23 elected TDs had been elected on the promise of scrapping the water charges and neither party can stand in the way of that mandate. Calling the past eight weeks a “farce”, she said there was little to distinguish Fine Gael and Fianna Fáil. She accused the parties of “playing games” and “leaving the Dail in cold storage”. McDonald accused Fine Gael, Fianna Fáil and Labour of unleashing “vicious austerity” on the people of Ireland. She said her party would not put Enda Kenny back in government, neither would the assist Fianna Fáil in doing so. Email “'Scarlet for ya': Mary Lou says FF borrowed their water charges policy”. Feedback on “'Scarlet for ya': Mary Lou says FF borrowed their water charges policy”.